A while ago UCL built a ‘Drift Table’ pictured above that allowed the user to float slowly over high resolution imagery of the United Kingdom. 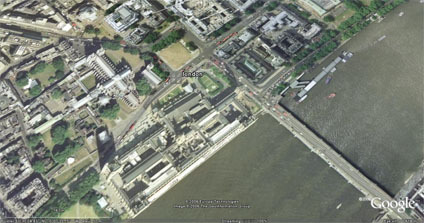 Google Earth has changed many concepts of digital geography one of which is the ability to ‘drift’ over the globe without a high powered table from Computer Science. One of my favourite, if frivolous, uses of Google Earth is to use a flick of the mouse while dragging to set Google Earth on a slow drift. It works best if you hover to about 600 metres, add a slight tilt to the view and then set it running. Its a complete waste of bandwidth of course but if run Google Earth in full screen mode and combine it with a 40 inch monitor it creates a great talking point as the high resolution imagery floats on a random path around the globe. Maybe its just me… but its kind of neat to have your own drift monitor to look up to now and again to see where on earth the image is from. The next scale up would be to mount the monitor in a table and create the ultimate office/home talking point…. Another way to do this with better control over the sights you see is to create a route (e.g. Driving Directions from New York to Los Angelos) and then choose the Play Tour option in GE to show the route. You can use the Options in GE to control the speed, height, and viewing angle of the tour for even better effects (including seeing the mountains and hills and you go by). Thanks for the comment Frank.. I like the randomness of just letting GE drift.. although to be fair the oceans can take some time to cover and become a bit dull. You could also draw whatever route you want and do a “Play Tour” on it. You could eather use GE Plus/Pro, or one of a number of tools to draw a polyline in a KML file.